Johannesburg (AFP) - As mining companies in resource-rich Africa bleed jobs due to plunging commodity prices, the ripple effect of redundancies has raised concern about social unrest amid declining economic growth. Top mineral-producing countries like South Africa, Zambia and the Democratic Republic of Congo have seen cash-squeezed companies slash workforces, shut operations and reduce capacity. 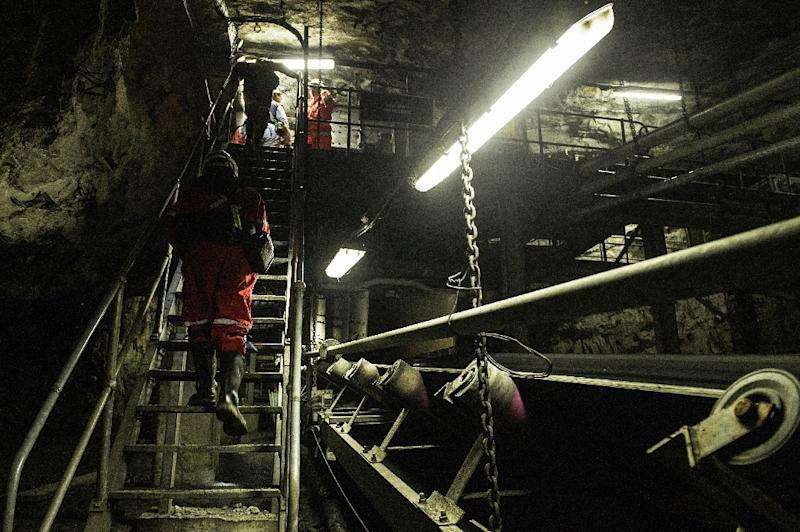 In South Africa, where mining has long been a critical source of jobs, unions say 19,000 jobs are on the line. Most of the country's current mining layoffs are in the platinum sector, which has seen a price drop of about 40 percent since 2011, while the gold sector has also been badly hit. "We are in crisis. Companies can't just let go of so many people," said Joseph Mathunjwa, the leader of the radical Association of Mineworkers and Construction Union (AMCU). AMCU led the five-month strike over higher wages at Lonmin in Marikana in 2012, which became a bloody symbol of the price of industrial unrest. Thirty-four miners were killed at the platinum mine when police opened fire during a violent wildcat strike, in a tragedy that badly shook South Africa's post-apartheid consensus. Zambia and the DR Congo have also suffered from a sharp decline in international copper prices, which have slumped by 25 percent during the first eight months of 2015, compared to the average price in 2014. "The contracting metal prices, especially copper and platinum, will continue to pressure companies to cut their costs," said Andrius Balsys, industry analyst at Euromonitor International. Balsys said, in addition to job cuts, companies were "expected to re-evaluate expansion projects more carefully" and may halt those in the pipeline. Switzerland-based Glencore this month suspended production at copper mines in Zambia and the DR Congo, as the company reels from what it described as the worst commodities market since the financial crash of 2008-2009. The Congolese government has urged Glencore to "respect its commitments" to the project and resume production. Glencore's Mopani mine in Zambia is the largest employer in the country's mining sector, with a workforce of 10,000. Copper is the biggest foreign currency earner for Zambia, where the local kwacha has been in free fall. Chinese-owned Luanshya Copper Mines also suspended operations, rendering some 1,200 workers jobless. "The African mining industry's challenges have to be seen in the global context of a slowing China and weak commodity prices," said Sarah Boumphrey, head of strategic insight at Euromonitor International. "The difficulty in Africa is that many governments are over-reliant on the sector as a source of export and government revenue." The commodity crunch came as South Africa's mining sector was suffering from prolonged strikes, escalating wage demands and regular electricity cuts that many companies blamed for poor profits. The industry, which has its roots in colonial times, relies on migrant labour from neighbours like Mozambique, Malawi, Lesotho and Swaziland -- making the impact of redundancies a regional problem. South African President Jacob Zuma's government has tried to step in, bringing together mine bosses and unions to find ways to avert job losses, in a country with a 25 percent jobless rate. "It is our collective responsibility to resolve the challenges as the mining sector is strategic to the South African economy," Zuma told a meeting between unions, companies and the government this week. The parties have signed a pact which calls for alternative jobs for redundant workers and for the selling of troubled mines, as opposed to abandoning operations. But the hard-line AMCU has refused to sign up with any government-led deal. Johannesburg-based labour mining analyst Mamokgethi Molopyane told AFP that the turmoil in the sector could not have come at a worse time. "The economy is ailing, unemployment is high, with increasing food prices," she said. "The massive job loses are certainly going to deepen the poverty levels and have a ripple effect." The collapse of mining employment is not new -- South African Chamber of Mines data emerged in May revealing 35,000 job losses in the gold, platinum and iron ore sectors between 2012 and last year. Further mass unemployment from the mines would pose a fresh headache for many African nations. The social risk was highlighted earlier this year in South Africa in a renewed bout of deadly xenophobic attacks by locals targeting migrants in unrest driven in part by lack of jobs.